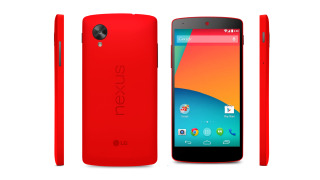 The popular Google Nexus 5 is now available in a dashing shade of 'Bright Red' from the Google Play Store on both sides of the Atlantic. Following an avalanche of leaks and speculation in recent weeks, Google has placed the newly-hued handset in its Google Play Store alongside the existing black and white versions. That lick of rouge hasn't altered the price either, with Google keeping the 16GB version at its respectable $349/£299 price point and the 32GB iteration at the equally reasonable asking price of $399/£339. At the time of writing the red Nexus 5 is available for shipping in 1-2 days, but that timeframe is unlikely to remain in play for long, given the history of Nexus stock shortages. Naturally the red Nexus 5, which packs a 5-inch 1080p display and a 2.26GHz Qualcomm 800 Snapdragon quad-core processor will arrive with the latest version of Android 4.4 KitKat as standard. Manufactured by LG and released in October 2013, the Nexus 5 earned a highly commendable 4.5 stars out of five for its great value, fab display and speedy performance in TechRadar's review. Will the new, attractive red coating encourage you to finally pull the trigger on a Nexus 5 purchase? Still can't decide on which Android handset is for you? Have a nose at our Nexus 5 vs Moto 5 showdown.